On 9 November, the Art School was honoured and excited to host a visit from Kazumi Murose, a world expert in Urushi, Japanese Lacquer. Kazumi Murose is a Japanese Living National Treasure due to his exceptional knowledge and craft skills in Urushi and his work as an Urushi artist and Conservator. 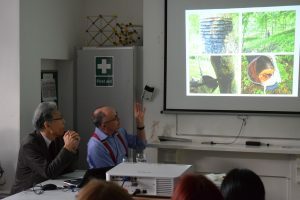 We were delighted when Rupert Faulkner, Senior Curator at the V&A and an expert himself in Japanese historical and contemporary art and crafts, suggested that he could bring Kazumi Murose to the Art School for a talk and presentation. Kazumi Murose was accompanied by his son Tomoya Murose, who is also an expert in urushi, working with his Father after many years of study at University and as an apprentice. 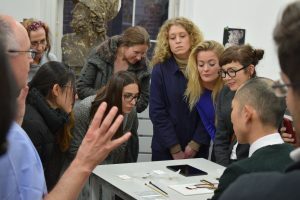 Following a tour of the Art School, Kazumi Murose delivered a fascinating lecture to Historic Carving and Conservation students, translated by Rupert Faulkner, that talked in detail about the history of Urushi as well as its physical properties and harvesting techniques. This was followed by a demonstration of Maki-e techniques (involving drawing with lacquer and the sprinkling of very fine gold and silver powders) by Tomoya Murose. 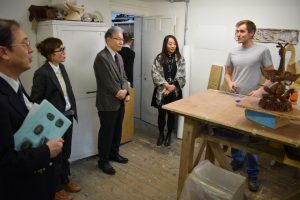 Third-year woodcarving student William Barsley (right) speaking about his current projects to (from left) Keisuke Omori, President of Toshiba International Foundation, Tamiko O’Brien, Kazumi Murose and Mari Shiba. The Art School would like to express their huge thanks to Kazumi Murose, Tomoya Murose and Rupert Faulkner for their valuable time and for a fascinating afternoon that we will not forget easily! There is a wonderful TED talk by Kazumi Murose available here.